Horsing Around | Fit Families | Kids VT - small people, big ideas! Enniskerry Farm is one of several stables that offer lessons in northwestern Vermont. Find lesson and camp info at enniskerryfarm.com. And you don't need to own a horse to ride one: When you sign up for lessons or camp, you typically use a "school horse" owned by the barn. More serious riders lease horses. Arrangements vary. In a "free lease," you cover the horse's expenses: farrier, vet and board. In a more typical lease, you pay to - of the horse's value per year plus expenses. The lease may run for a month, six months or a year, and riders will sometimes share the cost. When preschooler Faith Ploof initially begged to ride a pony, her parents thought it was a phase. But after a year of repeated requests, the little blonde got her wish: Her parents signed her up for riding lessons. That was six years ago. The phase has turned into a lifestyle the whole family has embraced. 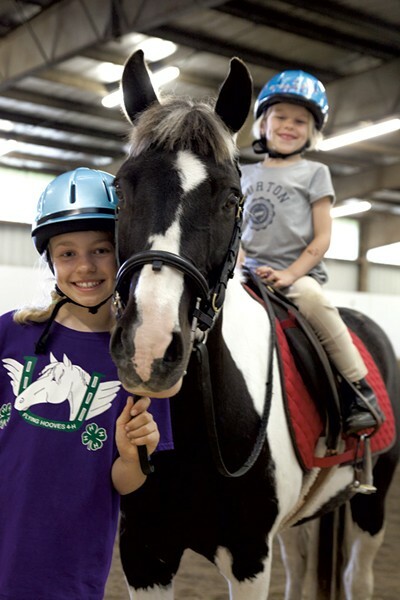 Faith, 11, now rides four to six days a week, competes in horse shows and has gotten her 6-year-old sister, Adaline, into the sport. "They pretty much live here at the barn in the summer," said their mother, Elizabeth Ploof. But the horses aren't the only ones getting a workout. It may surprise those who don't know a canter from a trot that horseback riding packs a passel of fitness benefits. "It actually works almost the entire body at once," Colchester stable owner Patty Hart-Ahonen said. HammerFit Athletic Club co-owner Jessica Ebert Edelmann agrees; she's been riding since she was 4. Horseback riding builds core strength, balance, flexibility and posture while working all upper and lower body muscles. It's even a cardio workout, she said, "because you breathe hard and you sweat." Try to find a single gym class that does all of that. Hart-Ahonen, who owns Enniskerry Farm, usually starts kids riding at age 6. They need to be sufficiently tall and able to concentrate enough to stay on the horse. The Ploof girls, from Essex, take lessons once a week and ride and clean stalls on other days. On a recent Friday, they were greeted by the smell of hay and dirt, along with three black labs that are part of the farm's menagerie. Faith brushed Kally, the 11-year-old American paint pony the family leases, and got her ready to ride. She put a sticky pad on the horse's back to stabilize the saddle, followed by a quilted, red saddle blanket and then finally the saddle itself. She tightened Kally's girth, the strap that goes under the horse and holds the saddle in place. Horses have personalities, Faith explained: "They're like people." Kally was a little challenging at first because she hadn't been ridden in a year. Now, after two years together, Faith understands her horse; it was she who first noticed Kally had sore feet a week earlier during a show. Faith rode around the arena, taking Kally from a walk to a canter, then dropping the stirrups in an exercise to ride more evenly. Meanwhile, Adaline helped get her pony, BJ, ready for her lesson. Once astride BJ, Adaline's feet reached only to the middle of his belly. Although she has most of her baby teeth, she orders the 725-pound horse around as if he's a teddy bear at her tea party. "BJ, stop! I want to get off," Adaline said. That, her mom and instructor agree, builds confidence. Riding also boosts stamina and body awareness. "You have to be very conscious of how you use your body," Hart-Ahonen said. A horse feels and responds to its rider's movements. Turn in the saddle, and the horse may turn. Clench the reins, and the horse won't go forward. Riding can also meet emotional needs, noted Ebert Edelmann, especially for girls in their early teens who aren't into team sports. "For some reason the connection with the horse and the responsibility of caring for the horse, and the feedback you get from a living animal while not just riding them, but taking care of them, interacting with them, is so amazing and almost addictive." After her lesson on that spring Friday, Faith rode Kally around in a loop to let her cool down before removing her saddle to comb and brush her. The girls' father, Brad, cleaned stalls. "My husband calls it 'barn time' because you get lost in it," said mom Elizabeth. Some nights, girls who ride at the stable hang out and talk. Elizabeth has watched them sitting on horses, laughing and taking selfies. "And that, to me, is just priceless. I mean, no cares in the world, no pretentiousness, just genuine friendship. "I often walk away thinking I would never want my kid anywhere else."